The developers of the Ferry Wharf project just south of the Ravenel Bridge in Mount Pleasant recently submitted plans to the town to more than double the residential component. Officially known as the Bridgeside II Planned Development District, the proposal seeks to boost the figure to 150 living units from 73. 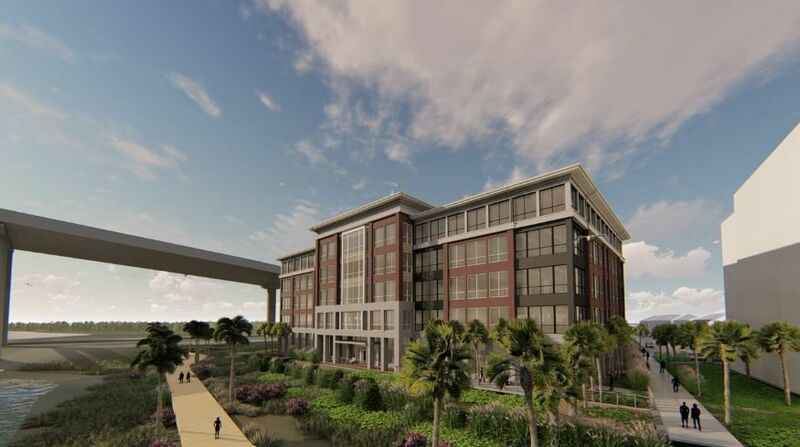 Under development now by Bennett Hospitality of Charleston is a five-story office building called Portside being spearheaded by Atlanta-based Holder Properties, a 175-room Embassy Suites Hotel and a 759-space parking deck. Other developments, including condominiums, are part of a future phase along the waterfront and adjacent land. A new apartment community in the Nexton development in Berkeley County is now offering its first units, not far from where a future theater could rise across from Cane Bay Plantation. The first 93 apartments are available in Arrogate Village, which will feature 264 units at 195 North Creek Drive when completed. The one-, two-, and three-bedroom rentals off Nexton Parkway feature wood plank-style flooring, custom cabinetry, walk-in closets and large balconies. Prices start at $999 a month for a one-bedroom unit to $1,550 a month for a three-bedroom apartment. Developed by Applegate & Co. and managed by Charleston apartment giant Greystar, the complex includes a saltwater pool, fitness studio, outdoor kitchen, fire pit, swinging daybeds, car wash, pet wash, package center and complimentary coffee bar. A Nexton official believes a mix of residential options is best for the growing development. “Achieving sustainable economic growth in our region requires us to offer a variety of housing choices that appeal to workers and employers alike,” said Brent Gibadlo, vice president and general manager of Nexton. The apartment community sits on the opposite side of the developing, 4,500-acre Nexton tract. On the southern end near Summerville a mix of single-family houses, apartments and commercial development has been developed. In June, Nexton Square Shopping Center, with restaurants such as Halls Chophouse and Taco Boy, will open near I-26 and U.S. Highway 17A. A North Charleston apartment complex has a new owner. An affiliate of Virginia-based Cohen Investment Group paid nearly $14.5 million April 1 for the 160-unit Bradley Square garden-style property on about 7 acres at 6600 Rivers Ave. That comes out to just over $90,000 a key. The purchase comes two years after the property, formerly called Hampton Oaks, sold for almost $12.8 million to a company formed by New York-based Toro Real Estate Partners. The purchase marks Cohen's first foray into the Charleston market and is its fourth multifamily acquisition in South Carolina. "Our expectations are to enhance property through planned capital expenditures and engaging an institutional property manager to enhance profitability and operations," said Hugh Cohen, president of the new ownership group. "We plan on adding more assets like Bradley Square to our portfolio in the coming months and years ahead." The property, which is near Trident Technical College's main campus, was nearly 95 percent occupied at the time of the sale. "This transaction is another example of the demand we’re seeing for well-located apartments throughout the Carolinas,” said Mark Boyce of Berkadia, which handled the transaction for the seller.